Other than the element of training your Pokemon to get to the higher levels, catching Pokemon is also important. In this game, we use a very child-friendly method of luring Pokemon with soup (instead of throwing all sorts of Pokeballs at random Pokemon). There are 4 pots and they give you various levels of Pokemon. They can be uncovered at various parts of the game. Given after completing round 10 (final round) Attracts Pokemon from level 71 onwards I personally like the bronze pot best because it helps me to get Pokemon of the right level to breed. When Pokemon are of higher levels, they take a longer time to level up and evolve. Apologies for the hiatus - work has been crazy and I've been playing 2 games: Pokemon Quest and Fishercat! I love both games for various reasons but let's talk about Pokemon Quest first. 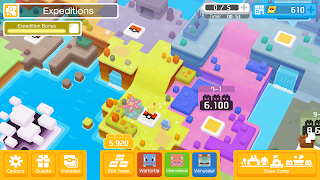 Pokemon Quest is a new addition to The Pokemon Company's mobile games after Pokemon Go. Well I kind of enjoyed Pokemon Go for 3 days then I got bored of it, but I think Pokemon Quest is more interesting because it gives you an interesting storyline as well as a chance to catch 'em all (150 in the first generation). The major draw is the nostalgic value and that everything is in cubes which is so cute!! You can download it from the play store and apple store, or get it on your Nintendo Switch. Currently I am only at island 7 - it gets exponentially tougher to level up and complete the higher levels, so I usually change my goal and evolve Pokemon instead. 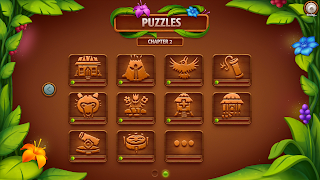 The new puzzles for chapter 2 are out! Check out my sneak peek of chapter 2 or the general walkthrough, and let's try to solve the puzzles together! Note: I will be writing another eBook for chapter 2, stay tuned! After the volcano eruption, it's your job to clear the wreckage and also build new buildings! Cool things like the school, healing hut, and residence hut are now made possible! Prerequisites Master buildersLevel 4 research technology Given that this is the first puzzle in chapter 2, it is definitely a good warm up to the next few puzzles to come! I am still quite annoyed that the eruption destroyed nearly everything we created in chapter 1, but I'm sure that the village will look even more awesome than before! So Chapter 2 of Virtual Villagers Origins 2 is finally out!!! I have just updated the app, so please give me some time to update my crafting and resources page, and also to solve the puzzles! Let's take some time to analyze this completed puzzle by Jing-jing Garcia Siador (thank you so much)! I have to take my time since I need to find out the prerequisites for new players. Nobodies is a point and click puzzle game where you have to help to hide bodies and remove all traces of evidence. It is somewhat like an anti-escape room where you try to hide things instead of fine them. The story has multiple endings - you can get into all sorts of trouble depending on the choices you make. But no worries, because you can get out of prison and replay the level by watching advertisements. The graphics is good and the storyline is intriguing, but the most interesting thing to me is that it is based on a true story (I wonder what a genius/schemer this guy must be). Get it on android here. There are 5 levels in all. From Chapter 7, we have solved the case and learnt that Mr Caterpillar's real name is Mr Ishimoto, and Queen of Hearts is Ms Maki Aakai. Cheshire Cat seems to know something about White Rabbit's suicide letter, but refuses to tell Alice. Alice then leaves without Cheshire Cat to the hallway and see March Hare. March Hare asks Alice to find him and runs away. You can view the previous walkthrough and controls here and here. Chapter 7 is the defining chapter of the game because it determines what truths will be uncovered in the game. There are 3 endings - True Ending, Good Ending, and Bad Ending. The true ending reveals the truth about the "bully" and Alice, the good ending just reveals the truth about Alice, and the bad ending wrongly accused the "bully" as the murderer. I love that there is cross examination in this chapter. Yay! We'll start with the bad ending since it's the shortest. Chapter 7: The Execution of the Bully Bad Ending From Chapter 6, somehow the school knows that Queen of Hearts is the bully and requests for a trial for her bullying. The chapter starts in the gymnasium where Queen of Hearts is put on trial. 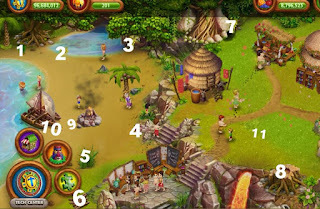 While waiting for the new chapter of Virtual Villagers Origins 2 to come, here is a quick overview of prerequisites for the puzzles in Chapter 1. You can view the previous walkthrough and controls here. From Chapter 2, Alice was accused of murdering the White Rabbit. Alice found clues in Chapter 3 to prove her innocence. Let's help her be "not guilty" in the Spiritual Trial. The Mad Hatter will interrogate Alice. Before I start the walkthrough, here are some basic controls of the game. MoveYou need to move Alice around the school compound to discover and explore new areas. Note that you may need to uncover some dialogue with other characters before you can unlock certain areas. Alice's Spiritual Judge is a very interesting hybrid of escape room + legal visual novel that is somewhat like a mishmash of the Zero Escape Trilogy and Phoenix Wright Series, which is awesome because I love both games (Zero Escape is my absolute favorite)!!! Ok so you play as Alice in this game and converse with various characters that are similar to personas in Alice in Wonderland i.e. Mad Hatter, Cheshire Cat, Queen of Hearts, etc. I love it that each character has some kind of development and story behind them, and that they are closely linked to the characters in the fairytale. Spiritual Judgement is something which is very interesting. It's a very literal translation of what the game is - a legal prosecution of Alice's morality and choices. As you journey in the game, you will need to find out more about Alice's story and make decisions that will help Alice figure the truth. For ease of explanation, I will call each screen 1, 2, 3, 4, and 5. Pink words means to take an item. Orange wordsmeans to copy or use a code. From part 2, you will get out of room 6 and go to room 7, which also decides the happy/sad ending of the game. 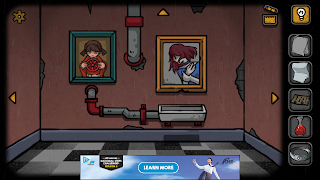 You see a room with pipes, a sink, and frames of a girl and a lady.